A saline solutions are a safe and trusted cleansing remedy for cleaning contaminents from eyes and wounds. These are the 30ml steritube that can be purchased individually or in a 5 pack. The price on our site is per single tube (30ml). 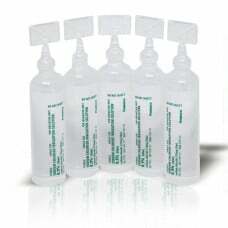 The saline is made up strictly of Sodium Chloride 0.9% sterile solution which is safe and cleansing for eyes and wounds. The salines is available in twist off ampoules.